During his 30’s, Leonardo took a great interest in flight, and by about 1505 had collected around 20 years of theory on the flight. In his sketches, he illustrates what is known as an ornithopter, but no one really knows if he actually built or attempted to fly the device. An ornithopter (from the Greek ornithos “bird” and pteron “wing” is an aircraft that flies by flapping its wings. Designers seek to imitate birds, bats, and insects. Currently, manned ornithopters have been built, and some have been successful. Two types are currently being used: those using engines, and those powered by the muscles of the pilot. There were some who supposedly tried to fly ornithopters prior to da Vinci, but it is thought that they merely glided their machines to the ground from an elevated location. An eleventh-century Monk by the name of Eilmer of Malmesbury is the first recorded person to document such activities. He was followed by the ninth century poet Abbas Ibn Firnas. In 1260 Roger Bacon also considered a technological means of flight. 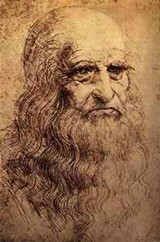 Leonardo da Vinci (April 15, 1453 – May 2, 1519, posed many questions about how to make a device that allowed humans to fly. He came up with several ideas for machines to fly, including a helicopter of sorts, glider, and even a parachute that would permit a person to fall from large heights. He primarily used the bone structure of the wings of bats for his studies and plans for building his wing designs. da Vinci’s device was designed that a person could strap themselves in and use their lower torso and legs as the muscle power for maneuvering in flight. He sketched a device in which the aviator lies down on a plank and works two large, membranous wings using hand levers, foot pedals, and a system of pulleys. In 1841, an ironsmith Manojlo attempted to fly a device described as an ornithopter. He climbed to a rooftop and launched himself landing in a heap of snow and survived. The first ornithopters capable of flight were constructed in France. Jobert in 1871 used a rubber band to power a small model of a bird. Alphonse Penaud, Abel Hureau de Villeneuve, and Victor Tatin, also made rubber-powered ornithopters during the 1870’s. 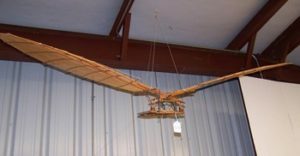 Tatin’s ornithopter was perhaps the first to use active torsion of the wings, and apparently, it served as a toy offered by Pichancourt. Gustave Trouve was the first to use internal combustion and his 1890 model flew a distance of 210 feet in a demonstration for the French Academy of Sciences. The wings were flapped by gunpowder charges activating a bourdon tube. Flapping wings offer potential advantages in maneuverability and energy savings compared with fixed-wing aircraft, as well as potentially vertical take-off and landing. It has been suggested that these advantages are greatest at small sizes and low flying speeds. 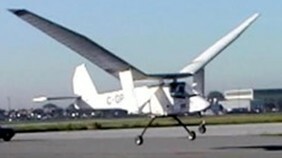 Unlike airplanes and helicopters, the driving airfoils of the ornithopter have a flapping or oscillating motion, instead of rotary. As with helicopters, the wings usually have a combined function of providing both lift and thrust. Theoretically, the flapping wing can be set to zero angles of attack on the upstroke, so it passes easily through the air. Since typically the flapping airfoils produce both lift and thrust, drag-inducing structures are minimized. These two advantages potentially allow a high degree of efficiency.